For many of us, Frank Sinatra could do no wrong, but that doesn't always mean that all projects with which he was involved were very good. This is a competently made detective picture, in which Sinatra reprises his role as Tony Rome in the character's eponymous picture of the previous year; in truth, without Sinatra in the starring role, this is pretty run-of-the-mill, movie-of-the-week stuff. In many respects, it's most interesting in watching what the late 1960s did to the Sinatra Rat Pack persona of five years before; times change, and today's hepcat is tomorrow's square. Sinatra's Rome is a slightly shopworn incarnation of your typical movie private detective: an eye for the ladies, a taste for the bottle, always with a wisecrack for the cops with whom he parries, always on the run from his bookie, to whom he's in too deep. Tony lives in Miami, giving all of this the feel of cut-rate Elmore Leonard; we meet him going deep sea diving, and lo and behold, while underwater he encounters the title character, a dead, curvaceous, naked blonde wearing cement shoes. (Sinatra clearly didn't do his own stunts, so there's a kind of falsity to all of this from the beginning.) What's a dead naked lady doing at the bottom of the ocean? And more important: what's it to Tony? It becomes relevant because he gets hired by Gronsky, a great hulking man looking to track down his woman—Gronsky is played by a scowling Dan Blocker, perhaps more familiar to you as Hoss from Bonanza. So Tony's mission is to find the girl, and it sends him on a journey through South Florida nightlife—most prominently, he meets and parries with Kit Forrest, the obligatory femme fatale, played by a scantily clad and much-ogled-at Raquel Welch. The badinage between the two of them is rewarding, if a little warmed over; it's certainly preferable to Tony's frequent run-ins with a couple of paunchy nightclub owners. The gay stereotypes are very pre-Stonewall, though the sissy figure is still with us all too often. There's also more than a couple of scenes in go-go bars, with one of the dancers played by a young and randy Lainie Kazan. Anyway, lots of the time this looks like little more than a TV movie, with conventional, ping-pong editing and drab cinematography and production design; the most frustrating thing, though, is that we don't hear even a bar of the leading man singing. The soundtrack tantalizes us with some bossa nova covers of songs that Sinatra sung, and sung well, including You Make Me Feel So Young and It Happened in Monterey, and it starts to feel like a silly inside joke to hear these versions and not the Chairman's. There's not a whole lot of tension to the story, as Tony doesn't have many plausible suspects to investigate (I counted one, and I was right); what's palpable, though, is a sense that the cultural moment is passing by Sinatra, and with him his lesser cohorts here, including Blocker and Richard Conte as the hardnosed cop. Sinatra would appear in only a handful of movies over the next thirty years; his voice will live forever, but a movie like this is little more than a footnote to his legacy. Image Transfer Review: A lot of this looks bleached out and uneven; some scratches in the source material don't much aid the visual presentation. Audio Transfer Review: The soundtrack is unremarkable, and the transfer doesn't call much attention to itself, either in stereo or mono. 6 Other Trailer(s) featuring Mother, Jugs and Speed, Fantastic Voyage, Fathom, Myra Breckenridge, Bandolero!, One Million Years B.C. Extras Review: One of the original trailers is in English, the second in Spanish; the other trailers on the disc are collected under a sort of Rorschach test of a title: Raquel Welch Theater. 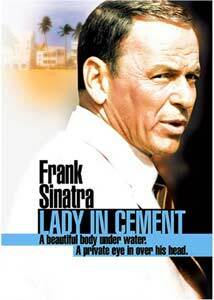 A pretty pedestrian detective story, elevated to some modest extent by the presence of Mr. Sinatra.